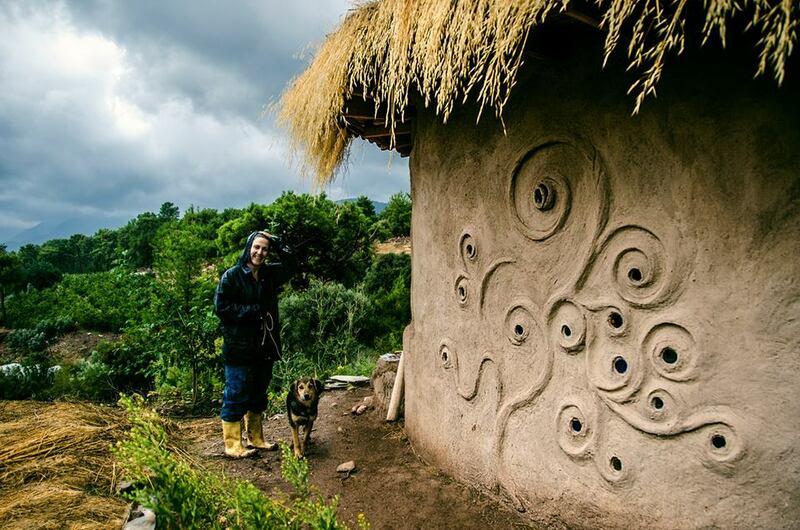 My earthbag house took six weeks to build and cost about US$5000 to make. Nearly all that money went on labour, the roof rafters and my beautiful juniper floorboards. There was no power or running water on the land. I didn't even know what a joist was when I started this project, so if I can do it, anyone can. You don't need prior knowledge. You can learn the skills. But you do need determination, and some decent friends won't go amiss either. If you'd like the dirt on what happened during those six frantic weeks while I tried to get my house up, it's all in Mud Ball. ​"If you've ever thought about going off-grid...this book is a must read." Dr Owen Geiger, Natural Building Blog. For the nuts and bolts of earthbag building, sign up for the free PDF. 20 pages of information and photos. First decide: is earthbag for you? Because it's not for everybody or every climate. If you don't actually have any earth on your land then that means you'll have to transport it in. Aside from the practical implications of that, it also detracts from the ecological benefits. 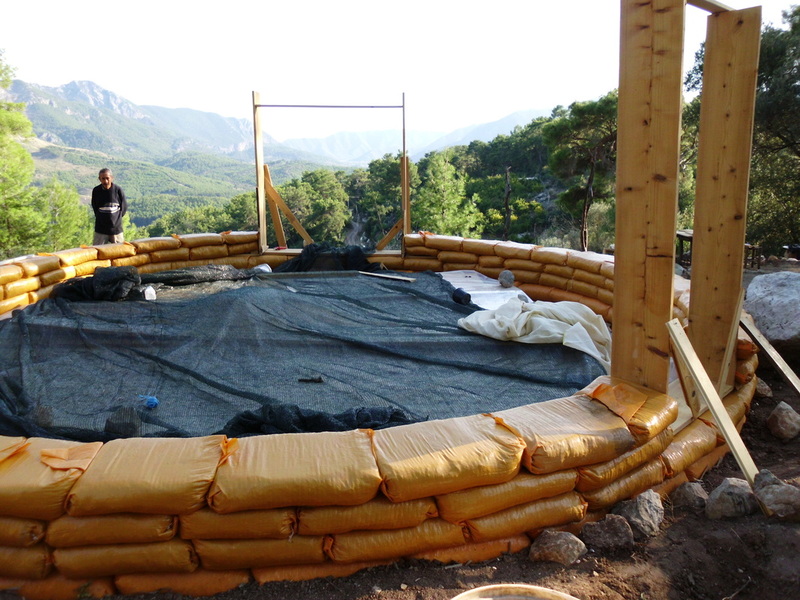 Earthbag is similar to cob in that it uses a type of rammed earth. The difference is, the earth cures after the house is built. Many people have asked me, "why use the bags?" 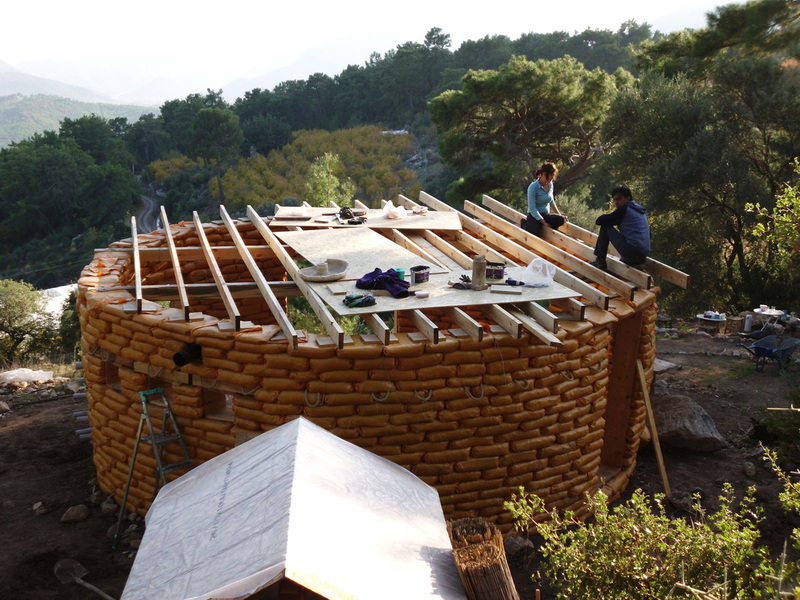 The earthbag system was invented by an Iranian, Nader Khalili, as sustainable, affordable, and earthquake-proof housing. The bags combined with barbed wire give the house incredible strength compared with other types of eco-building. Can withstand flash floods, as the bag structure and the barbed wire combined create a solid framework for the mud. Cob walls are known to disintegrate in severe flash-flooding. During building, lifting the earthbags to higher levels and tamping require a fair amount of physical strength. Takes longer to finish the interior than a cob house. Good thermal mass (retains the heat/cold for long periods). Soil has a poor insulation value compared with strawbale, i.ee strawbale houses can be heated quickly, but lose that heat faster. Earth takes longer to heat up, but stays hot for longer. 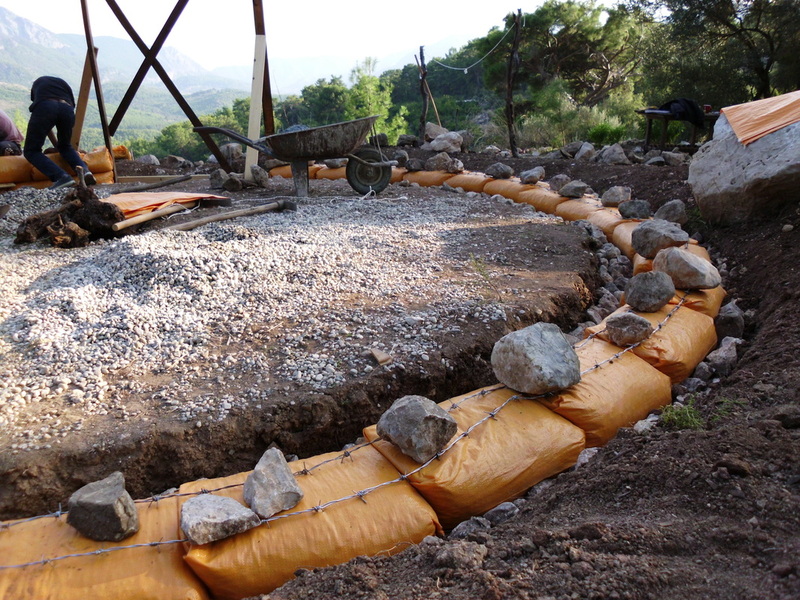 Earthbag is IDEAL for roundhouses. If you're in a seismic area like most of Turkey, then round is the way to go. Round is not only aesthetic and soothing to the spirit, but is also the strongest shape of structure you can build. Cars have been known to hit earthbag roundhouses with no more than plaster damage. Mine has survived four major earthquakes and is in exactly the same condition it was when I built it. If you're dead-set on corners then you need to plan buttresses for them. Straight walls are weaker than round ones. 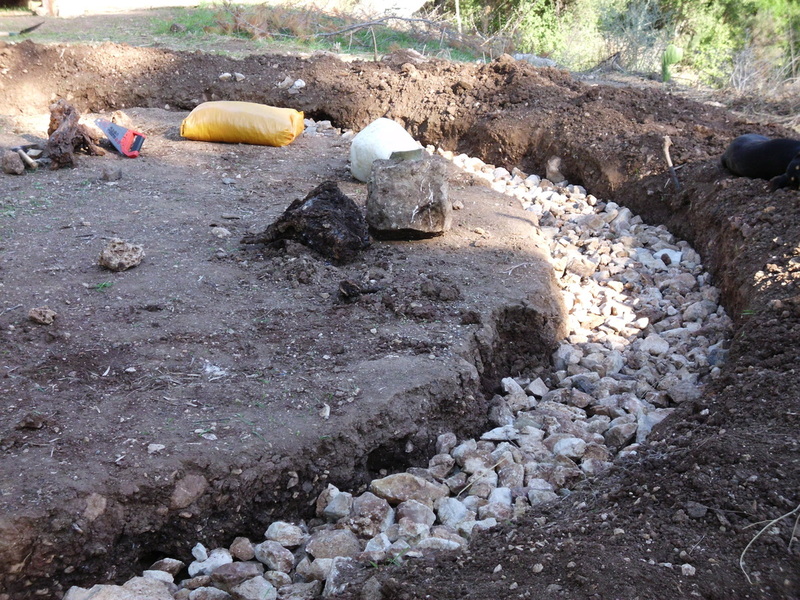 See the earthbag building blog for more details. You can also have a post-and-beam structure and 'fill in the gaps' with earthbags. It's not as strong, but building laws in some countries approve them that way. I didn't make a single drawing before I started and adjusted the design as I went along. It worked! But there are some advantages to pre-planning, especially for shelves, alcoves, tables or seats for roundhouses, electric and water fittings, etc. If you're the planning type, take a look at Geiger's dream homes site. KEEP IT SMALL. Everyone says the same and it's true. You can always add rooms later. Even a small structure can be exhausting. Mine was just a one-room circle with a three-metre radius and I'm very glad I didn't try anything bigger. First layer of gravel-filled bags. No one believed a gravel foundation system would work. But if you live in an area that experiences a lot of rainfall nothing beats it. See Gravel Foundations for details. This house's foundation system was documented in detail in the Natural Building Blog. See article. Let me take you back to the beginning . . .
"Why would anyone move into a tent and live on a mountain for eight months? 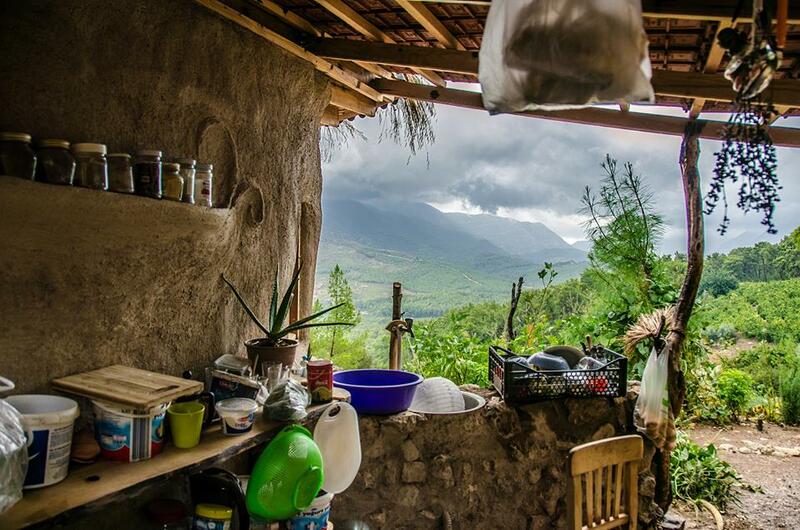 A mountain with no power, no water, and no permanent shelter to speak of. The trouble all began with a dream, and in many ways it ended with one too. Only it was a dream I had never planned. One I hadn't expected at all . . ."
Barbed-wire between each layer of bags. Tamping is key. It's also hard work. 1. Try to keep your walls straight (easier said than done on a round house). Use a plumb-line to check. 2. First of all, take an earthbag and fold the corners in. 3. Fill it with a specified amount of damp/slightly wet earth. 4. The first bag in the circle needs to be nailed shut. 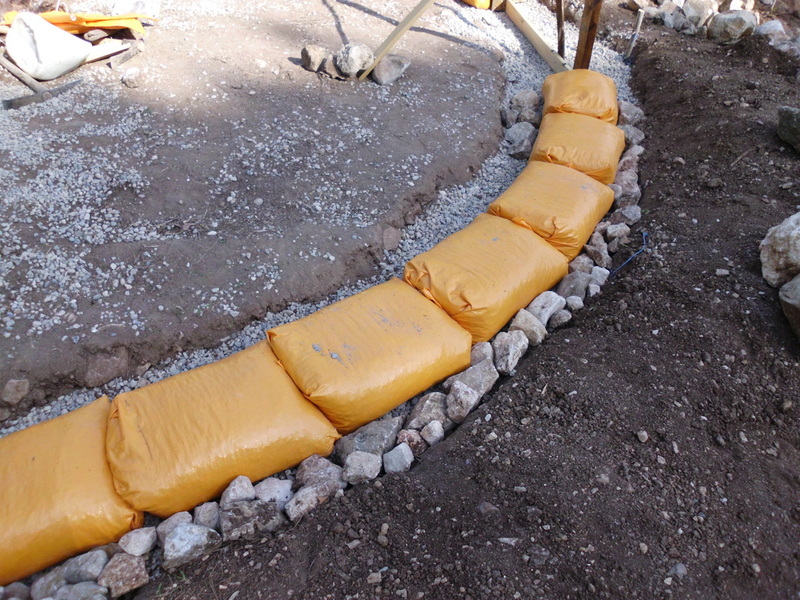 The second bag is laid up against the first so that the two openings are facing each other. The first bag holds the second shut. 5. Keep laying bags until you finish a circle. 6. When the circle is complete, take something heavy and flat and tamp the entire layer until the soil is nicely compacted and the bags snug. Tamping is key; it's also damn hard work. Adnan looking far too happy at the beginning of the window debacle. Fat lintels are easier than arches. My windows were a disaster from start to finish, which is why I didn't put up photos. One thing I can say is, however badly you mess up, there's always a solution. 1. Making moulds is the best way to ensure your windows stay in shape. Bear in mind that as you tamp your bags, they are rammed up hard against frames, and will bend or warp them unless the frame is incredibly thick. 2. Moulds can be made from scrap wood if it's lying about. The only trouble with the moulds is, they are devils to get out. You can also use strawbales, barrels or drums, wagon wheels, and tyres. 3. 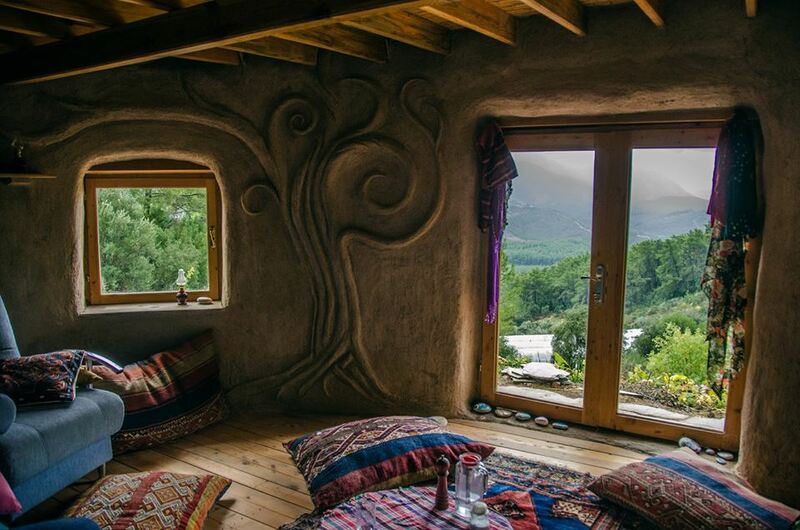 You can make beautiful arched windows with earthbags that are super-strong. 4. Inserting wooden anchors between layers of bags is a useful way of creating somewhere to bang your window frames in once the walls are finished. 5. If your windows or door frames are not arched, you need nice fat lintels instead. This is definitely easier, but uses more timber. For more information on windows and doors, I recommend "Earthbag Building: Tools, Tricks and Techniques" by Kaki Hunter and Donald Kiffmeyer. If it's a roundhouse then there are some nice options for roofs. 1. You could try a reciprocal roof. 2. Or an earth (living) roof. 4. 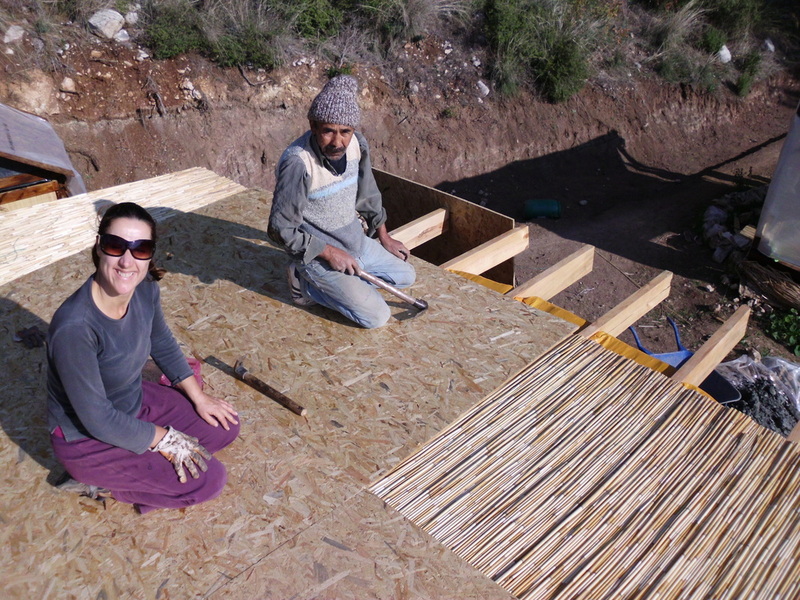 When you lay earthbags over these slats to fill in the gaps, the roof becomes mighty secure. 5. If you are really paranoid, or suffer tornadoes, you can tie or cinch the joists down as well. Joists laid on thick slats to prevent them sinking. Celal and I getting the plywood down. It took us just six weeks to get the entire house up, but over a year to plaster it! Earth plasters are an acquired skill and you'll need to practise a fair bit to get the mix right. 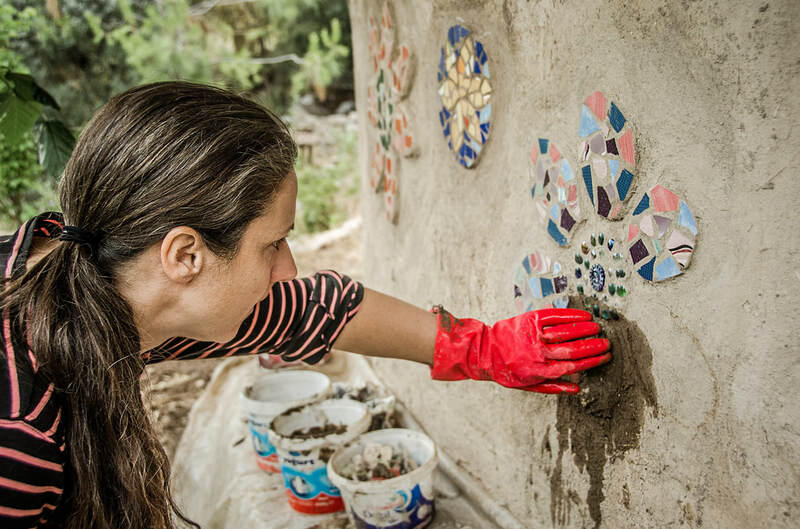 Read all about the ins and outs of earth plaster HERE, or simply sign up for my earth plaster mini-course instead. That will set you off on the right foot. This is just a brief guide to earthbag. If you'd like more details and photos then get my free earthbag building PDF below. If you benefit from this free information, please consider supporting the Mud Home on Patreon so that it can continue. BENEFITS FOR PATRONS INCLUDE: Email priority, my private Facebook group, review copies of my books, sneak previews of courses, Q & As, priority for courses, volunteer places, and workshop hosting.